Random Acts of Kindness Day is today, Monday! Often known as RAK Day, Random Acts of Kindness Day started in New Zealand in 2005 when Josh de Jong decided there just wasn't enough love in the world and something needed to be done about it. I would embellish this story with "It was a cold gray morning when..." but, I don't know what the weather was like when Josh had his epiphany. What I do know is that, if it weren't for him, we'd all be mean as fire ants! Send someone a letter of appreciation or "thank you." If you interact with a waiter, customer service person, or any local employee, send their boss a letter of appreciation for their good work (and remember to compliment the employee, too!). Visit someone in prison (that's from the Bible). Give a card, small gift, or flowers to someone for NRAA (no reason at all). Unconditional love, baby! A back massage always is appreciated. You can give the massage yourself or give a gift card for a professional one. Help the elderly: read to them, help them across the street, visit them in prison "the old folk's home." You get the idea. There are so many more great ideas. What can you come up with for this day? Random Acts of Kindess Day has a Wiki Page; and go to Amazon to see the book. 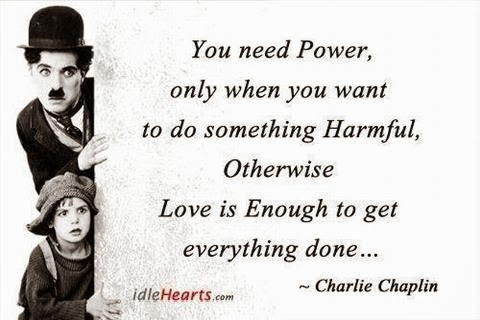 Charlie Chaplin gave a great memorable speech! We need more RAK.